In addition to being the home of the Johnson Space Center, the Clear Lake Recreational Area is also known as the Boating Capital of Texas. It has the greatest concentration of boats of any region in Texas and claims the third largest fleet of recreational boats in all of the United States. It's located about 45 minutes southeast from downtown Houston on Galveston Bay. Construction of the Marina in the late '80s is often credited with the rebirth of Kemah, Texas. We are located on the bay side of the south-end base of the Kemah-Seabrook Bridge on Hwy 146. 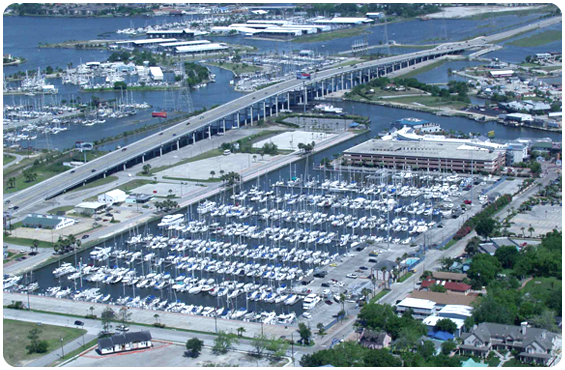 Making us the closest marina to Galveston Bay. Get Directions. If you are coming by water – head North up the Houston Ship Channel from Galveston. Turn west at Marker "63" and watch for the Clear Creek Channel. Landmarks to watch for are the Kemah Bridge and the amusement rides at the Kemah Waterfront. Go past restaurant row, turn left at the Aquarium Restaurant, before the Bridge. Lat 29°32.7' N Lon 95°01.18' W.